I hope everyone had a great Labor Day. Long weekend's are great, or in my case long weekend's attached to a week off - makes me not want to go back to work. Too bad I didn't win the Megamillions on Friday ($132MM would have helped out nicely). Anyhoo, I decided to spend some of my weekend walking around the city and seeing what was new. Based on a recent Globe article about how the Saks Fifth Avenue renovation is almost done at the Prudential - I decided to start there. 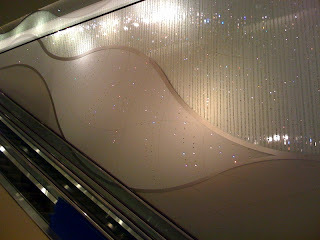 The upscale department store at the Prudential Center in Boston this week unveiled a Swarovski bejeweled mural along its escalator as part of the store's latest renovations. The sparkling spectacle is the largest crystallized wall and the only one of its kind in North America, with more than 1 million crystal elements. 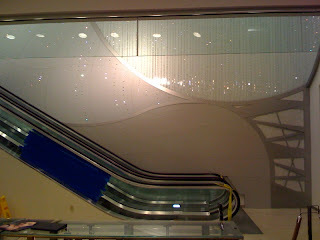 The current renovation began in January 2006 and included replacing traditional cosmetic counters with clusters of smaller bays with chairs and mirrors, adding walk-in boutiques along the walls featuring handbag collections from Louis Vuitton and Dolce and Gabbana, and moving the shoe department upstairs with new designers such as Fendi and Valentino. The renovations are expected to be completed by Sept. 25. 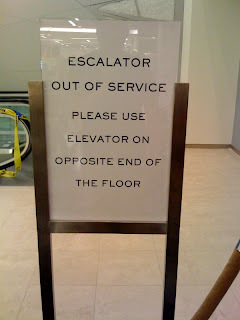 Hmm, what the article failed to mention was that the elevator isn't working yet. Color me disappointed when I got there. I wanted to take some closer shots, but the area was roped off. Click (here) to read the Globe article. 0 Response to "Saks Fifth Avenue Renovation Almost Done"
Does Anyone Miss Their Trans Fat? Review: Cirque du Soleil's Kooza Is Awesome! I'm Going To Be In Edge of Darkness!